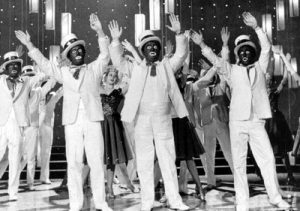 Comments Off on JAZZ HANDS – COULD THEY BE JUST A TINY WEE BIT…..RACIST? Students at Manchester University have decided that applause and cheers create an unsafe environment for some people because it can be intimidating for students with autism, sensory issues or deafness. Ms Khan, the union’s liberation and access officer, who proposed the motion at a recent meeting said clapping can “discourage” some from attending democratic events. 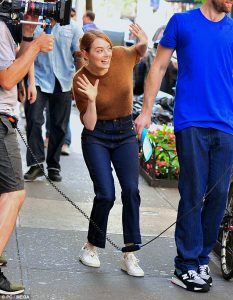 So-called “jazz hands”, she said, encouraged an “environment of respect”. “I think a lot of the time, even in Parliamentary debates, I’ve seen that clapping, whooping, talking over each other, loud noises, encourages an atmosphere that is not as respectful as it could be,” she said. 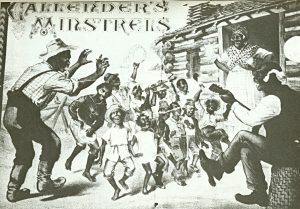 But the pic of Emma Sone doing jazz hands did seem to stir a long forgotten memory buried way back in TV Past – The BBC’s Black and White Minstrel Show from the 1970s where white men in blackface danced and sang surrounded by a troupe of pretty white girls, recreating the long established tradition of American minstrel shows. Although it initially attracted strong audience numbers the basic premise of the show, a stereotype of the child like black man, alternately jolly and sad but without any depth of intellect began to fit less comfortably with the times and in 1978 it was cancelled. So maybe those Manchester students might be a tad less comfortable if they were aware that they were perpetuating an action that could be considered demeaning to black people and just……racist….